Who Needs Judgment When You’ve Got Data? You Do. 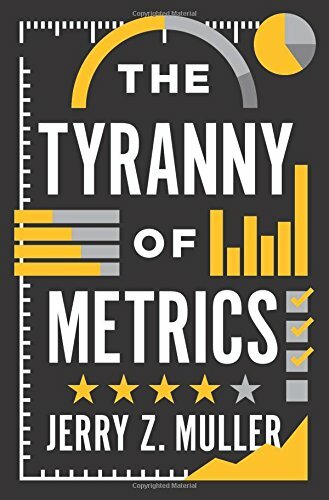 Author Jerry Z. Muller discusses his new book: The Tyranny of Metrics. Scholars in the field of behavioral psychology delight in demonstrating that biases lead us to misestimate numerical values and probabilities, casting doubt on judgment. Those who belong to groups that may have suffered from social bias identify judgment with prejudice, and prejudice with unwarranted discrimination. To them, “objective” metrics comprised of “hard” numbers may seem like an antidote. Measured performance is also proposed as a solution to the suspicion that public-sector institutions like schools, police departments or government agencies were being run more for the benefit of their employees than their clients, in other words, as a solution to the problem of time-serving. From yet another direction, management gurus tout the unbeatable effectiveness of algorithms based on big data. Consultants are quick to recommend that the solution to organizational deficiencies demand more data. I found that having a lot of statistics around after the “Quality” craze, didn’t make people look at or understand any better. We got nothing, except maybe resentment, from having the janitor chart is efforts and some of the engineers, paid little attention because they had the analysis delivered by software to their desks, rather than going through collecting and analyzing to understand the data. They would come to me, for “help”, aka do their work for them by someone who had done it the hard way. I was reviewing a foreign site, where a quality problem had come up, and I said we knew the cause/correlation. The engineer pushed back, but his very next slide proved my point. I enjoyed watching his boss, eat his lunch…Not to mention my improved credibility. Just another tool, used wisely is good, used wrongly or not at all is not. There was a fairly recent publication that made a claim that there was a certain positive correlation between gun laws and reduced crime. However, the writer forgot to erase the correlation info from his XL slide. All I had to do was click and enlarge the image. He obviously didn’t understand stats too few points and such a low correlation coefficient. It was right up there with the moon phase and position of the chicken bones… But the general public would have no clue to that. He came across as an “expert”. We humans believe what we want to or things that reinforce our views. All you have to do is play that game. Mr. Muller raises a problem that has been identified many times by both scholars and practitioners: the misuse of metrics in management for rewarding and punishing behavior. Perhaps the best article I have read on this topic is “On the Folly of Rewarding A While Hoping for B.” In this article written in 1995, Steven Kerr uses a wide range of examples to demonstrate how focusing on specific behaviors to the exclusion of others can lead to unintended consequences (the point Mr. Muller makes in his book). The real problem is not with metrics. It is with how metrics are identified, measured, and used. For example, counting the number of potholes repaired by road crews, and rewarding crews for productivity, may result in many potholes filled that wash out with the next hard rain. However, counting potholes filled–that stay filled–both identifies the correct metric and rewards the correct behavior and results in a desired outcome–the community has potholes that are both filled and stay filled. Professor Cade Massey at Wharton along with Nobel Laureate Richard Thaler at the University of Chicago have identified the benefits of understanding and properly using data analytics. See their article (“Overconfidence vs. Market Efficiency in the National Football League”) on how NFL teams that use experienced scouts’ judgment for making draft picks routinely make errors in identifying talent. By understanding the data, as they demonstrate in their article, new insights are gained in talent identification that simply don’t come from seasoned scouts using gut instincts. And, of course Michael Lewis’s book Moneyball, describes baseball’s discovery that data analytics can lead to better decision making and better organizational performance. Recent articles in the Wall Street Journal focusing on baseball (see “The Data Wonk Who Became a Coach” and “The Mariners’ Big Data Experiment) describe issues of how to properly implement data analytics as a tool of management, not whether it has value. Contrary to Mr. Muller’s thesis, human judgment is not eliminated, or frankly even discounted when data analytics are used properly. The highway department, and some humans in it, must decide what is important and ensure that what is measured (the metric) is neither contaminated (measures something not important for performance) or has omission (fails to measure something important for performance). It’s not really an either-or situation (metrics vs. judgment). Actually it’s a both (metrics and judgment), and knowing when to use each.